« A Night of Fashion. Maxi-Dresses: How to Wear Them Through the Fall. Labor Day generally marks the end of summer, and though the first of fall isn’t until the 22nd of this month, we’re already gearing up for the pre-fall season here at Zou Zou. Blazers, fur and those warm autumn colors have all understandably arrived in our stores to welcome the coming season, but we’re also seeing a lot of what one might generally perceive as a summer trend, namingly: the maxi dress. Easy to pair with sandals, belts, and bright summer hues, the maxi is an easy to-go outfit for the summer, but for the fall, it can be hard to see where a floor-length dress known for being “light and breezy” could work for cooler, darker days. And so we arrive at Maxi Dresses: How to Wear Them Through the Fall. Since we don’t usually start getting cooler here in Florida until mid/late October, don’t think your maxi is a no-go just because it’s sleeveless. The key to switching it from summer to fall? Accessories! 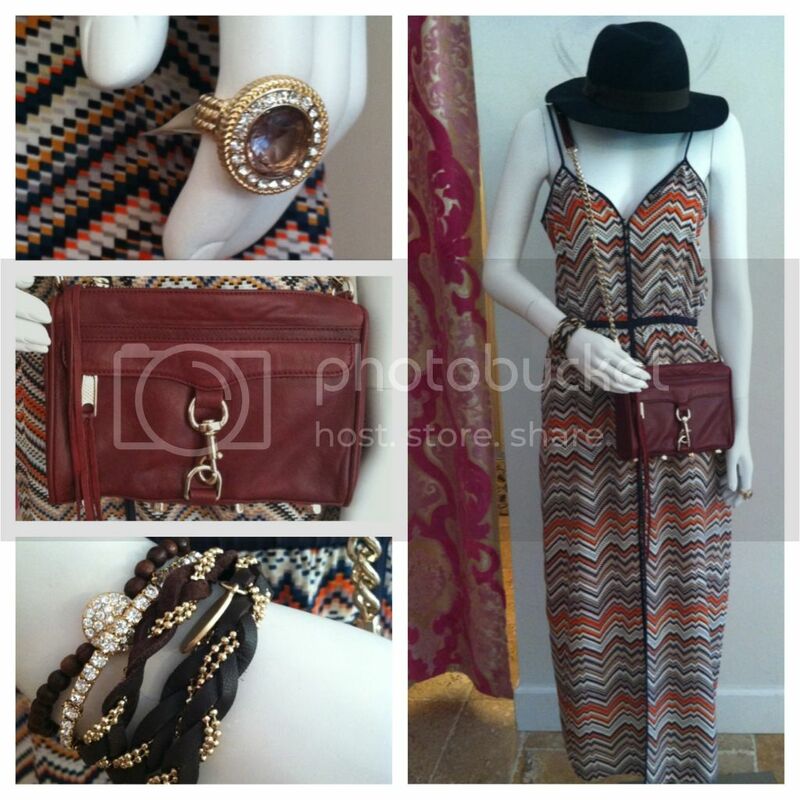 As NYFW called it this past February, the color “oxblood,” a dark shade of maroon, is all the rage for fall, and when done in the form of a cross-body bag, it’s just the right amount of fall fashion to transform your maxi to the next season. A hat, wrap bracelets, and a cocktail ring help bring the rest of the outfit together. For the shoes, swap out sandals for ballet flats or ankle booties! If you’re scared a thin-strapped maxi still might leave you a little too chilly, a maxi with a flutter sleeve is the perfect alternative to shy your shoulders from the cold. As the fashion world seemingly gets edgier and edgier, you can add pieces like this spiked-bag to roughen up your outfit ever so slightly, without pulling out the black lipstick. Finish the look with a stack of bracelets and your favorite dainty necklace to balance everything out. One of my favorite ways to take a maxi from summer to fall is by layering, but most people find the concept daunting. I broke it down in three easy steps, starting with a simpler maxi you have in your wardrobe. Solid colors and slender fits work best, and I generally like to keep the first layering piece a complimentary solid as well, like an off-the-shoulder white tee. Next add a piece that will pop to keep things from looking too boring, like a fun tie-dye scarf or a chunky necklace. You’ll find yourself looking very fashion-forward, and the look as a whole, when done right, can be very flattering. Finally, if all else fails, remember some of the keys components of fall, and dress up your maxi as-such. Deep hues like cobalt or a printed belt made with primary colors work wonderfully in fall when they might look a little too dull in summer, and a jersey maxi versus one made with silk will help keep things looking cozy and appropriate for the season. The best clothing pieces are those that can universally carry you through every season fashionably and comfortably. If you bought a few maxis over the summer, think before putting them away come fall, and if you didn’t, there’s never been a better time to invest in one!